Some albums are born classics while others need a more revisionist approach. The Clash’s second album ‘Give ‘Em Enough Rope’ is definitely in the latter category. If any album was in need of a critical rescue 37 years after its release then it’s this one. Back when this album was released I was 15, just about to turn 16, and I’d played their eponymous 1977 debut album, The Clash, to death. Every single track on the first album, according to my young ears, was amazing. At the time I’d worked hard to earn the money to buy this album by having two paper rounds, one early morning and another one in the evening. In compete contrast to today; music back then was an expensive commodity. I worked hard, saved my money and rushed out to my local record store to buy this record. When I got it home and first played this record I was pretty disappointed. Where was the anger, where was the aggression and where was the confrontation? In fact, where was the punk rock? This record sounded like some mid Atlantic over-produced pro-rock band? Retrospectively there seems to be some social and economic parallels between the UK today and the late seventies. It was a time of economic depression, the working class were still down trodden by the conscienceless political rulers and moneyed elite, racial tensions simmered and a generation of disenfranchised young people with no future prospects were ready to lash out a wave of destruction in the form of riots in protest at the injustices of the world they find themselves in. We’re not quite there with the youth riots yet, Brixton and Toxteth style, but they are definitely on the horizon if things don’t change. It was during this period that The Clash released their second eagerly awaited album ‘Give ‘Em Enough Rope’ on 10th November 1978. When all the other major British punk bands died in 1978 and were replaced by tepid New Wave acts, CBS (the Clash’s label) tried to push the band into the US market whether they liked it or not. In preparation for the recording of this album the band undertook a ‘secret’ mini tour of the UK Midlands. Bernie Rhodes, the band’s manager, and the record company had settled on Sandy Pearlman, a heavy metal producer with a commercial track record with bands like Blue Öyster Cult, to produce their second album. He was described as the “Hunter S. Thompson of rock, a gonzo producer of searing intellect and vast vision” in the Billboard Producer Directory. Between 24th and 26th January 1978 The Clash played in Birmingham (Barbarellas), Luton (Queensway Hall) and Coventry (Lanchester Polytechnic). According to Paul Simonon (2008) “The record company had this idea that they wanted a big name American producer for the second album”. The record company felt that the band’s first album was just too raw and not radio friendly enough for American audience’s refined taste. Pearlman attended all three shows to audition the proposed material for the album. At the last show at Lanchester Polytechnic in Coventry (26/1/78) Perlman tried to get backstage just before the show to meet the band. Mick Jones’s old school friend, Robin Crocker (AKA Robin Banks), was taking care of backstage security and he didn’t know who Pearlman was. Crocker wasn’t a man you messed with. Some heavy duty manners were employed to keep Pearlman from going backstage resulting in the longhaired American record producer lying prostrate on the floor blood pouring from his nose as the band stepped over him to take to the stage. As normal The Clash don’t play by the rules, what a great introduction to your new record producer. Pearlman must have been keen because this incident did not dampen his enthusiasm to make their second record. As 1978 wore on an exasperated record company desperately wanted a follow up album to capitalize on the quick and cheap first album. CBS did not release the first album in the USA; it was only available via import, as they thought the quality was not high enough for American audiences. To compound matters, the once wholly supportive music press where also starting to view The Clash with suspicion amid claims that they were lazy and not pulling their weight. Strummer and Jones de-camped to Jamaica for two weeks to write new material prior to recording. The whole band reconvened and undertook an initial multi-track recording at Wessex Sound Studios, and Basing Street Studios in London. Wessex Sound Studios would become The Clash’s studio of choice for future recordings while Basing Street would see Mick Jones return there with Big Audio Dynamite. 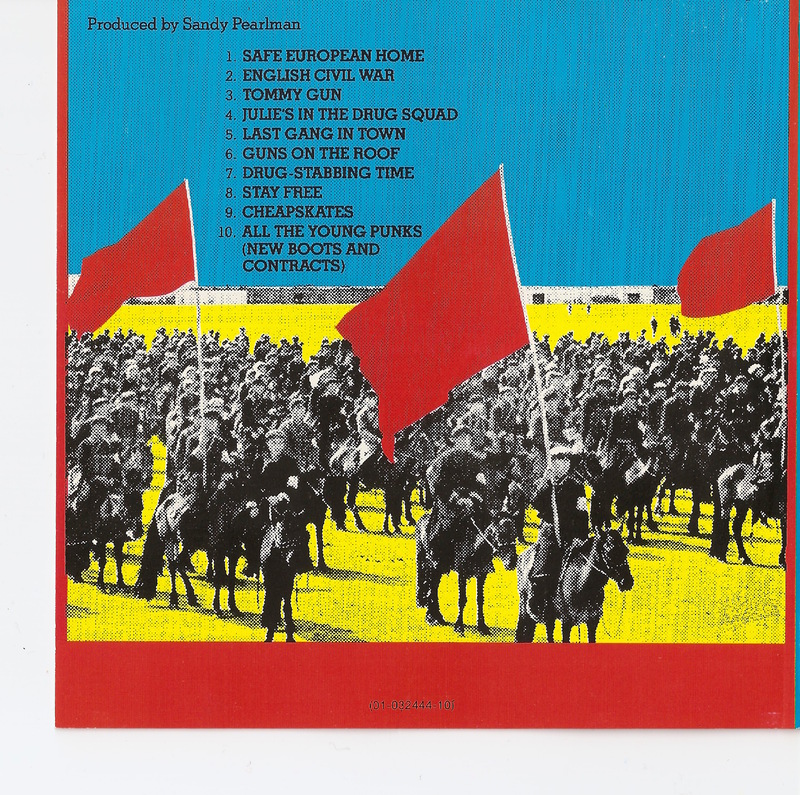 The Clash, Sandy Pearlman and engineer Corky Stasiak spent many weeks recording the tracks for Rope. This was in complete contrast to the first album, which was recorded and mixed in CBS’s own basic Whitfield Street Studios, London. The first album had urgency to it; it was recorded and mixed over a three-week period working Thursday to Sunday each week. The band, and in particular drummer Nicky ‘Topper’ Headon and bass player Paul Simonon, complained about the nick picking way that Perlman recorded. Both complained bitterly about the lack of spontaneity during these recording sessions. Once recording was complete Mick Jones and Joe Strummer claimed to have been virtually kidnapped and taken to San Francisco for overdubs and mixing. Jones and Strummer probably went to San Francisco without Headon and Simonon quite willingly but their claims aid the myth and legend of The Clash. What is known is that Headon and Simonon where very pissed off about not being involved in the USA overdub and mixing sessions. CBS Records, The Clash’s record company, initially owned The Automatt studios in San Francisco but by 1978 it was sub leased to ex-CBS employee David Rubinson. The studio complex was known for its top-notch equipment and for the radio friendly hit records it produced. Between September and October 1978, singer Joe Strummer and guitarist Mick Jones worked with Pearlman at The Automatt to record overdubs for the album. Flying in from the UK, Jones and Strummer stayed at the Holiday Inn in Chinatown, and almost every night they went to see punk bands play at the Mabuhay Gardens, known locally in the punk scene as ‘The Mab’. Between takes at The Automatt, Strummer and Jones listened for the first time to the Bobby Fuller Four version of I Fought the Law on one of Rubinson’s studio lobby jukeboxes. When they returned to England this song was re-made into a Clash classic which would make its first appearance in March 1979 on their short, five date, London Calling Tour. Then in May 1976 it would become the stand out track on The Cost Of Living. The results of the Rope are not nearly as good as they could have been and there are perceived to be three major flaws. First of all, Pearlman hated Strummer’s voice and buried it disastrously low in the mix. Secondly, he packed the sound with distortion, booming drums, and overdubbing, making all the songs sound similar and muddying the impact of The Clash’s considerable guitar fury. Thirdly, the lyrics Strummer wrote came under attack because they were considered histrionic, esoteric and soaked in melodrama: they look unkindly on British punk. What the public didn’t understand was that Strummer’s lyrics were self critical of the band, his own career and the world at large. Mixing the drums so loud on this record is probably a testament to the abilities of Topper Headon. This is one of the few albums in the DKHQ Album Rescue Series where I largely blame the production on the album needing a rescue. In this instance I would opinion that Pearlman was a bad choice as producer for this record. It could have been much worse though. At the time there was no digital audio workstations (DAW) or software, which allows for the manipulation of audio. If this DAW software and technology had been around at the time of recording, and had Pearlman used it as un-compassionately as he did of analogue recording technology available at the time, then this album would probably be un-savable. The Clash were not in a pleasant situation during 1978. They were being accused by the music press of selling out, of being phonies and being pushed by their record company for a more commercial, clean, mainstream, sound which they apparently loathed. The music falls apart under the war between producer and band; commerciality and creativity never sit well together. In abstract form the songs written by Joe Strummer are fantastic, and would have been truly world-class had a more sympathetic production been employed. Safe European Home is a great mixed paean to Kingston Jamaica, Tommy Gun is a chilling take on terrorism, Drug Stabbing Time has an undeniable rock groove. Stay Free is a world-class romantic history of the band, written in true Mott The Hoople style by Mick Jones about his childhood mate Robin ‘Banks’ Crocker (he of the Pearlman punching incident pre recording of Rope). I would agree that these songs aren’t punk songs; correct they aren’t. This is Strummer developing as a lyricist, in the same way that Jones was developing as a superb studio arranger. This is the sound of The Clash leaving punk behind and moving into much more interesting territory. Rope is a transitional album. These facts should be celebrated because without Rope we would not have the undeniable classic London Calling or the equally impressive Sandinista. Rope is The Clash and in particular the creative talent of Strummer/Jones developing and serving notice on what’s to come. The album cover features a painting in stark flat colors of a Chinese horseman looking down at an American cowboy’s body being picked at by vultures. The album art was designed by Gene Greif and is based on a 1953 postcard titled End of the Trail. 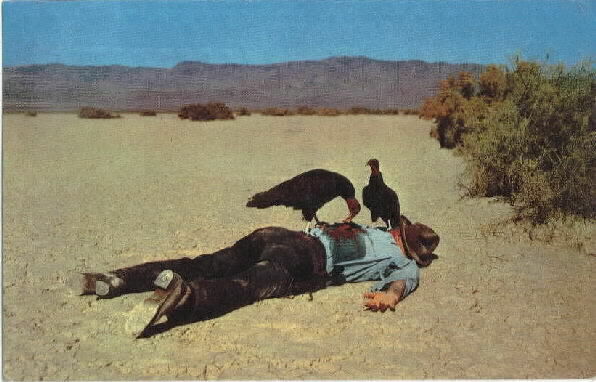 The original postcard was photographed by Adrian Atwater, and featured the dead cowboy Wallace Irving Robertson. Joe Strummer and Mick Jones had come across a painting titled End of the Trail for Capitalism by Berkeley artist Hugh Brown that was on display at San Francisco’s punk rock hangout the Mabuhay Gardens. Strummer and Jones would have seen this picture many times during their three-week stay in San Francisco while attending gigs at ‘The Mab’. It obviously made a lasting impression as the album cover and picture have a striking resemblance. The original postcard titled End of the Trail (1953) by Adrian Atwater depicts the dead cowboy Wallace Irving Robertson. Maybe 37 years is enough time for us to re-evaluate this largely ignored album and accept it into the cannon of The Clash’s work? In many ways this album is like a set of rough sketches of ideas and concepts, which would be employed on further work. On the first album, The Clash stuck to their guns and insisted on Mickey Foote mixing it despite opposition from the record company. On Rope they caved in to CBS and their decision led them to having Sandy Pearlman as producer. In actual fact this gave them a good position to bargain from, insisting that Guy Stevens produce London Calling. The other noticeable fact is that the last gang in town were split into two factions, Strummer/Jones and Simonon/Headon, during the writing, recording and mixing of Rope. Strummer/Jones are probably the beating creative heart of the band but they needed the Simonon/Headon lungs to function. I’d love to hear a Mick Jones re-mixed and re-mastered version of this album from the original multi track tapes (if they still exist). Maybe we should think of this album not for what it is but for what it could have been? Despite the inappropriate and unsympathetic production, this is a great album and is well worthy of rescuing.